I have been itching to get things rolling for the hobby in 2015; I must have recently leveled up because I am finding that the models are being finished faster and they are looking better than ever before. So I am pumped to start showing off what I have to offer. My Dark Angels are getting an overhaul. and I am going to need to focus on them first. The Necrons are going to need to be dealt with second. I have 80 finished warriors or so but everything else is primer black. finally... I want to get into fantasy. When the 9th edition starter box drops I am (probably) going to double up on it and buy whatever is facing off versus empire. 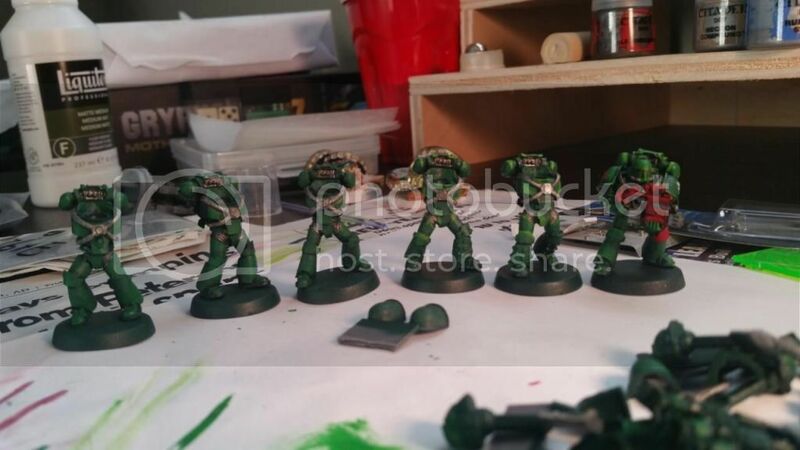 Here are some of my 30k MKIV marines. Yes, I know they should be black... 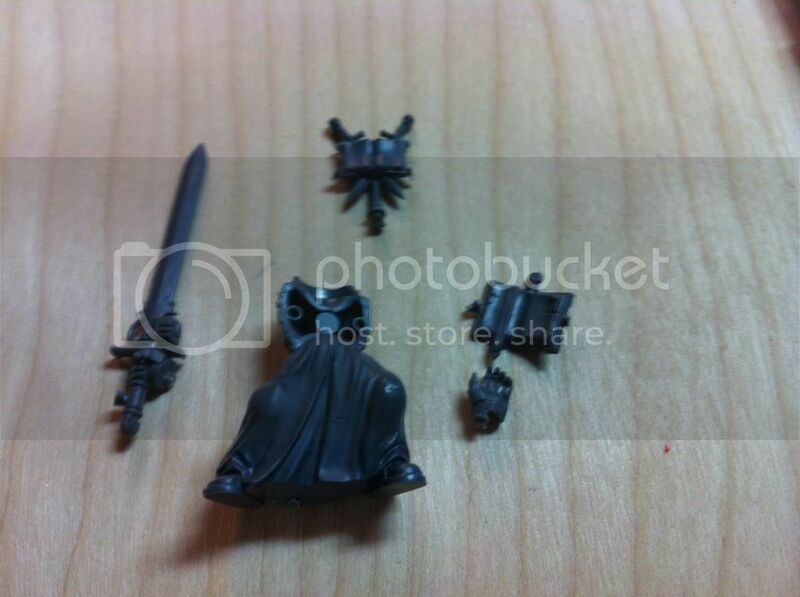 I want to use these guys as vets for my normal Dark angel lists. So my custom ezekiel is coming together pretty well. 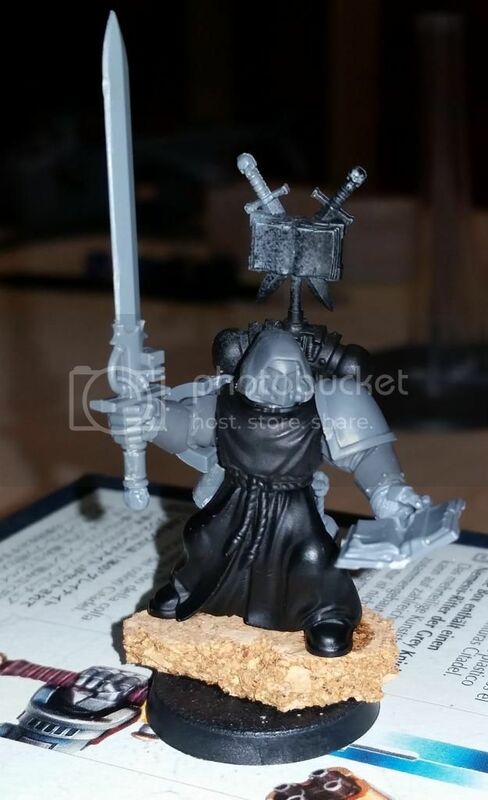 he is supposed to have a big two-handed sword and a book that confers a buff to people... so I am going to use a big sword from a grey knights kit fro the right hand (i think it is big enough to count as a 2-hander) and I am going to put a book in the left. I am going to try and find a MKIV helmet to put on him and then put a hood on him. You cant actually see a psychic hood in the real model so i am not going to worry about it here. He will have a cloth hood though. Looking good so far, loving the Horus Heresy...trying to not buy into it yet. Maybe next year...or whenever Thousand Sons come out. looking good! You managed to get a really cool looking green on them! I got the libby put together. That looks really good so far. Can't wait to see it painted. 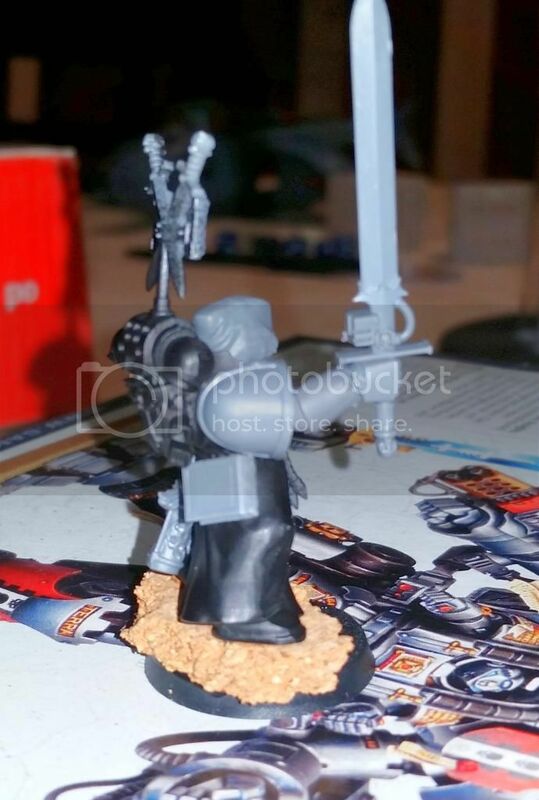 Interested in this kitbashed Ezekiel, I'd qualify that sword as a 2H weapon. *edit* Helps a lot if I make sure I've read through both pages. He looks good. 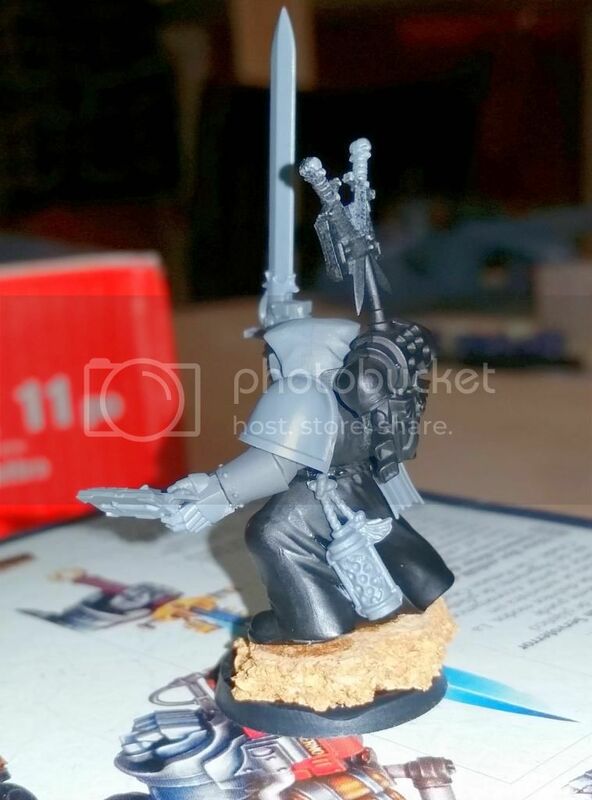 Vault wrote: Interested in this kitbashed Ezekiel, I'd qualify that sword as a 2H weapon. 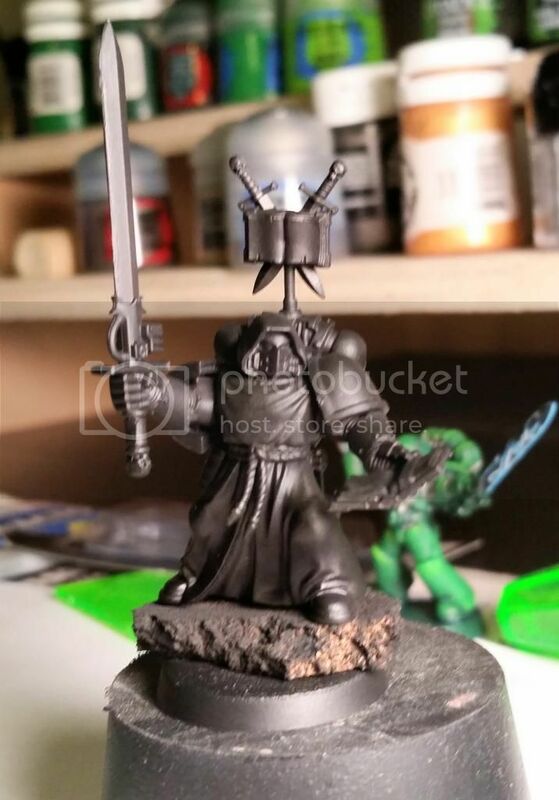 A friend of mi email was giving get me crap for having him with a helmet. I really to not like the idea of walking around without a helmet on. All of my other painted librarians are actually painted green but I might just make this guy blue to separate him from the pack. Not sure. I am going good to paint him tomorrow. 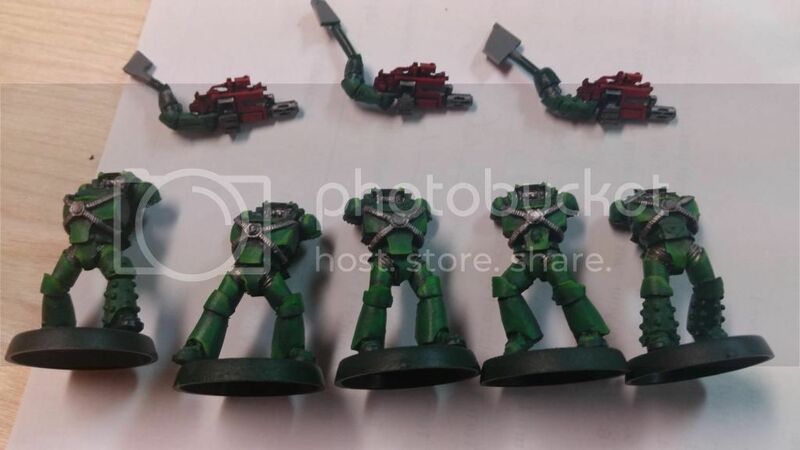 I know what you mean; the only marines I have without helmets are either sculpted like that or I ran out of helmeted heads during assembly. I do understand that being unhelmeted makes a character more unique and easier to spot on a tabletop... it just doesn't make much sense in regard to the setting. When you're fighting for control of a moon with no atmosphere and the entire enemy command structure is running around with their heads exposed to the vacuum... Lore does say they can sweat a protective barrier that offers limited protection to vacuum exposure but they do need to breathe... eventually. Are you using an airbrush or blending by hand? They look great! Dez wrote: Are you using an airbrush or blending by hand? They look great! No airbrush. Layers and layers of paint glazing. 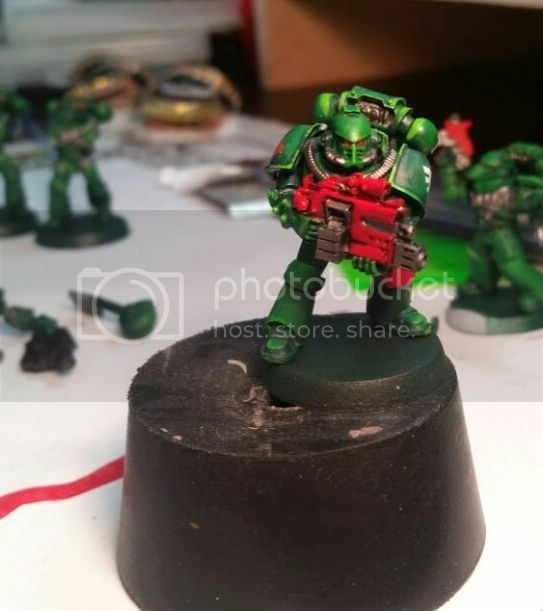 It takes me forever to paint but I think I have marines finally figured out.